Life-size bronze Eagle statue created by Max Turner (United States). This is a magnificent sculpture and the detail is just incredible. As you can see in the pictures this is actually 2 eagles fighting over a fish. The beaks and talons are all done in a very highly polished bronze. 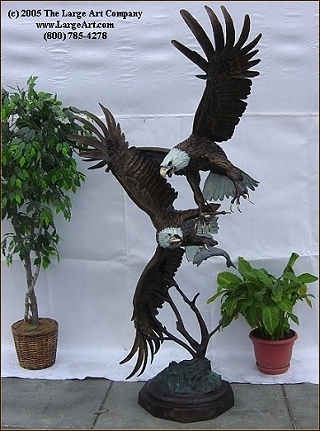 This is one of our most popular wildlife sculptures. Measures 92" tall x 53" long x 42" wide. We normally cast this piece with the brown eagle with a white head and tail. However, we can also do it in all brown or an antique Verdi green or any combination you like.